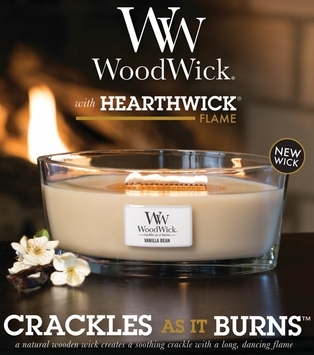 NEW HearthWick Flame Scented Candles by WoodWick let you experience the cozy comfort of a glowing fireplace anywhere in your Home with it’s soothing crackle and long, dancing flame! HearthWick Flame Scented Candles combine the best features of WoodWick and RibbonWick candles. HEAR- the soothing sound of a crackling fire. HEARTH – long a cherished symbol of warmth, love and special family moments… home is where the Hearth is. HearthWick candles come with a wooden lid.